As promised, I have been working here and there, with help and advice, putting together two wheels, a frame, handle bars, cranks, brakes, tires, tubes, pedals, seat post, saddle and pieces of bicycle to create and know a new bike. The frame arrived on my birthday; yes, truly and unforgettably on the actual day-made-even-lovelier-day of my birthday, in the very early part of summer. As the summer has been ticking by I have been living with the frame in various parts of my house. I have been eying it after road rides and more than eying it after work. 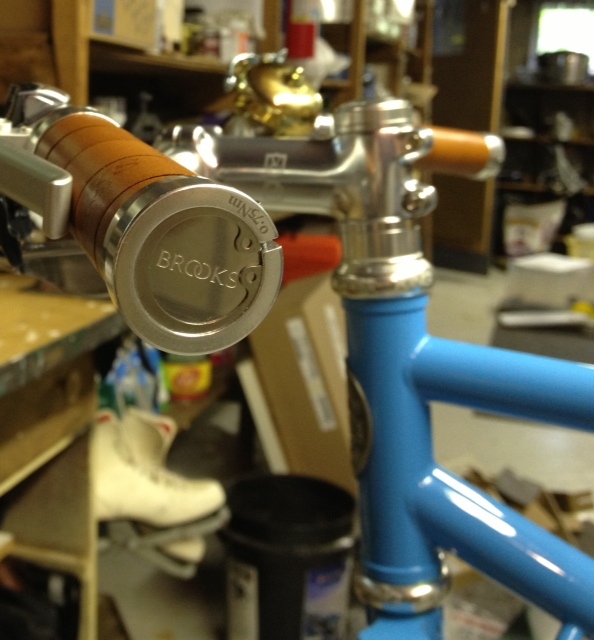 The other bike parts, the same. Before I started building, I admired the different pieces day after day, took them out of boxes and moved them around on different tables, all with anticipation. Admittedly, it has been slow finding the time, and even more importantly the right sense of time, to begin putting it together. But here it is, coming together weekend-like at last. This is a project not to be rushed. In putting it together, there has to be time to just love it, in every minute. Unlike my road bikes, the Sweetpea is a leisurely bike. 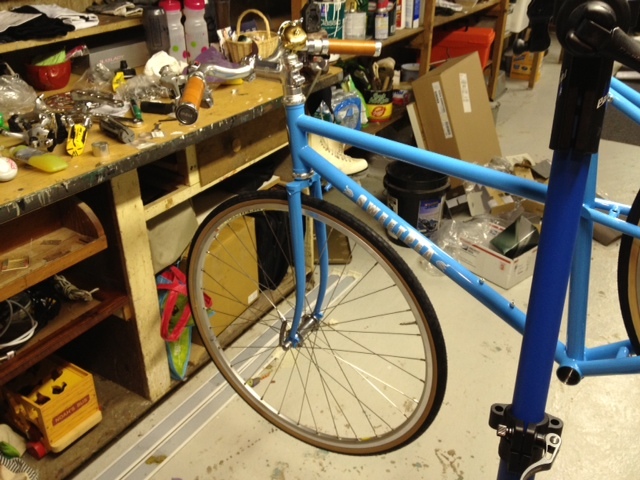 I am experiencing it coming together with the same generous amounts of time I hope to spend riding it around my town. With this bike, I will not be counting miles or miles per hour– although there is endless fun in ticking off and beating time, in knowing the push of time and the tautness of body needed to lose the slowness of office weeks and boring commutes that require a car. The light speed of my road bikes are incredible machines in and of themselves. And a dirt and gravel road ride that will be gritty and tough is just ahead, a week from now. That ride on hilly and rocky terrain–at a good speed given the amount miles that will have to be covered–will not be for the Sweetpea. I let myself forget that being away from the discipline of consistent riding would mean having to start over again. But did I say that it only really feels bad starting over for the first ten miles and then I remember that within all that effort is a reliable strength in my body that hasn’t been tested too badly over the winter? I remember that winter is an easy thing from which one recovers. And on those winter days when I wasn’t riding…sure, I missed my bike, but I have no complaints about the time spent with my dog on the couch. This being out of shape is old news though. There is an off season to dancing and, just like cyclists, there is a fair amount of stealth training going on then. Injuries sometimes have to get healed, surgeries happen. The body of a dancer is constantly being built up, refined, and re-tooled, off season or not. A class heavy on turns prepares a dancer for one ballet, a class heavy on big jumps for another. It really is an incredible machine, the dancer’s body; not just sleek-looking in terms of athleticism, but created and truly tuned for the purpose of movement of any and every kind. Then further refined for each particular show. If the bike is an extension of body, a way to get that much more strength and speed out of it through the benefits of real mechanics, then there is familiarity to be found in building and tuning it. There is familiarity to be found in putting one together, at least once. It is possible that it is not so much speed or racing that I am in love with on the bike but the mechanics that I know nothing or very little about, just as when I was dancing I could not tell you one tendon in my hip from the next. I knew broken, sore, and strained. I knew flexible, strong, and loose. But intuitively, or more precisely intuitiveness achieved through years of ballet training, I knew how to build my body and had people around me, coaches and teachers, always helping me refine it and I liked that the machine worked smoothly and predictably, almost one hundred percent of the time. I enjoy the larger mechanics of my bike with a much greater vagueness. So the newness of putting a two wheeled machine together, knowing the kind of rides that I am putting that bike together for and how it will be built with specific purposes, lines, and details in mind hits an irresistible intersection. Repetitive as seasons can seem, my spring has this much anticipated first in it, the first bike I will somewhat put together, somewhat in that there will be a great deal of help of course, and I think mainly I will have the bike components in my hands for a moment or two, then someone else will do the cabling and bolting together. The various parts are arriving in boxes. 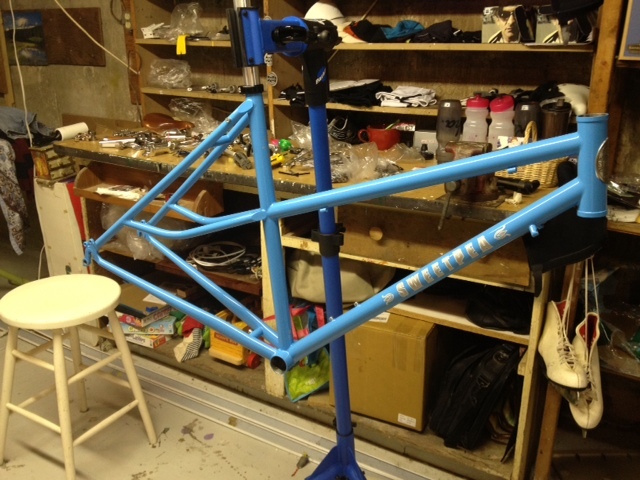 The frame, a really wonderful one, will arrive around my birthday in May, just in time for summer. And there is an old tandem bike that has come to me and I am thinking about refurbishing that, as well. Those are my new hill climbs. Unfamiliar, yet exceptionally inviting. Did you know that ballet technique is one of constant tension? It is a vocabulary of seeming effortlessness born of pushing into the floor while pulling up out of one’s entire body. Is this one side against the other or an ideal and sustainable harmony? Both, either, many formulations of each possibility at different times. We have all read the “this is war” accounts of bike races. Similar can be written about ballet and here is likely where, for me, my love of cycling began; this line where struggle and perfection meet. In a recent photo essay on New York City Ballet, there was a reference to covering the backstage life of ballet as being similar to covering war (http://www.nytimes.com/slideshow/2012/12/30/arts/dance/20121230_NYCB.html?ref=dance). How this is so is confounding at first but makes sense as more a reference to how similarly the scenes unfold in the covering of them than actual war–the comaraderie, the daily travails and the constant vigilant focus. I wonder what it is that makes us watch these battles? Cycling shows us crashes and injuries. It shows us the dilemmas of training and competing at all costs. Ballet shows us athletic prowess but only under the face of gracefulness, a less visible battle. For me, dancing is far less interesting on stage than backstage. In the backstage version, the “I am covering war now” we do see all sides of the battle. The best side being laughter among a very close knit and unusually focused group of people. The worst, wrecked up bodies waiting to heal and emotional fraying over endlessly high standards of performance. There are no damaged bikes along side dancers though to give us a true visual of the toughness of ballet and the extremes of what is accomplished there. There are always two directions when thinking about making time for cycling in the winter–why I am too busy to do it and why I cannot afford to miss my one bike ride of the week at the moment. In the past, for me there was the discipline of daily ballet class. Every day. Maybe not seven days a week, but often six days a week, and definitely no less than five days a week of daily class. And not your daughter’s ballet class, one of cute tikes in pink leotards. Think ferocious athletes, about 45 of them all in one mirrored room, all going for it in combinations of steps that are as familiar to them as breathing and sleeping. And always playing with that fire of how much to push beyond reasonable limits and how much to hold back to avoid injury and or exhaustion. Sure, some days I would really hold back for whatever reasons, to conserve energy or repair my body. But even holding back then was hardly a holding back of much. So one bike ride a week during the deep winter is not asking much of myself. But like everyone in New England during this time of year, some weeks it is a pinch just getting in the one ride. I did say winter riding would be beautiful, didn’t I? That was back in the fall or early winter before the snow and real cold hit, wasn’t it? Yes, the romanticized side of winter riding. Warmth. Chatter. Two sentence conversations that provide a week’s aftermath of laughter. Post-ride espresso. The smooth gearing of my bike. The fantastic mechanics of the body and many bodies working together getting through a ride. Beautiful riding gear. Sweet winter. As good as ballet class. But ballet class was always hard and demanding. 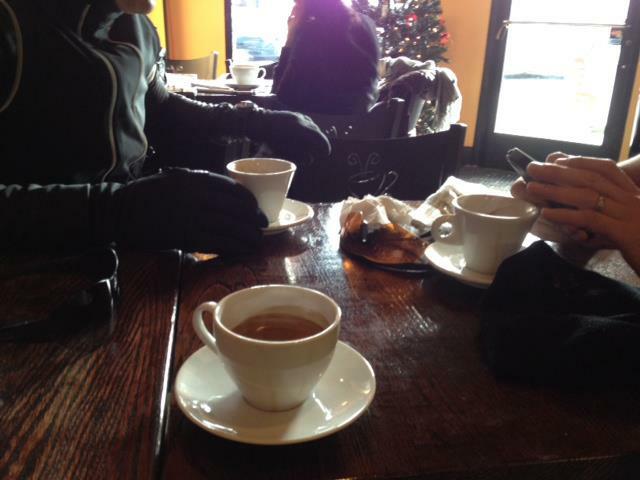 Winter riding requires greater discipline, too. You have to demand more than just a little from yourself. Not a simple hop on the bike. Riding two hundred plus miles in California is just as you would imagine it: sunny and warm, miles passing without even realizing it. Cycling often holds metaphors for life so perhaps it’s true that living in California, with the means to really enjoy it, as one enjoys a really nice bike, is a little work but mainly play. As I was instructed heading out on the first day’s leg of the Cali Tour: “The bad news is today’s ride is hilly; the good news is it’s all downhill.” Imagine getting born and this is the prophecy handed to you: a sloping, downhill ride, under perfect skies…along the Pacific Coast Highway in California. But the pleasures of my East Coast life are here for me. I came home from palm trees and Pacific waters to the cathedral-like beauty of autumn in New England, arches of trees and warm colors constructed leaf by leaf. When hit by certain angles of light, this could bring nearly anyone to their knees in the private little forum that is one’s mind, regardless of elevation gained or lost. 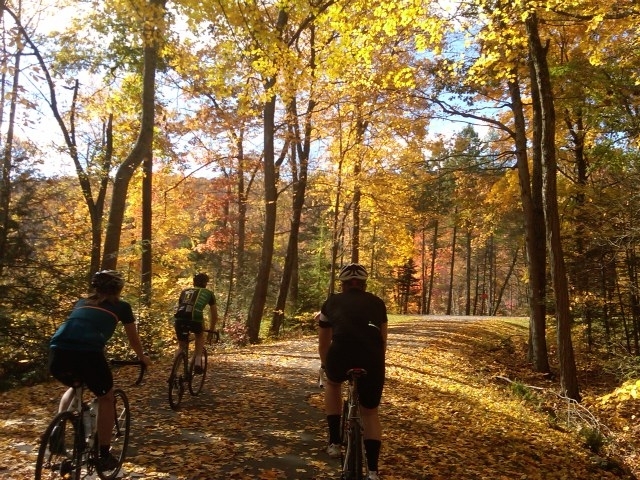 If you know what it is to ride through the sunlight of autumn as it comes streaming through changing leaves, you know that its effect is that of exhilaration…that in effect, it’s a racing downhill ride. Hands off the brakes, fingers ready to slow the rush but staying open to speed. Coasting, concentrating, and letting go, all at the same time.